The competition brief clearly set out the 5 year stategic plan reinforced at the briefing meeting held on site. The ‘all through school’ will innovate and support the challenges faced by the local community with christian values at the heart of the School’s future. 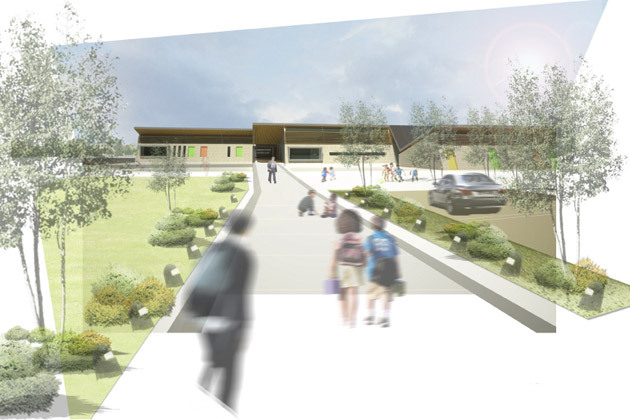 The design will encourage collaboration to deliver success for the staff and pupils and to quote the schools motto ‘Nothing but our best will do’ and so the same should apply to the design team. The existing secondary school was completed in 2010 under the Building Schools for the Future Programme. The new school sits in the centre of the site having been built before the demolition of the old school at the east end of the site. The remainder of the extensive site is made up of car parking spaces and playing fields with some open grass areas. The far playing fields to the west of the site are currently under utilised due to their distance from the school. 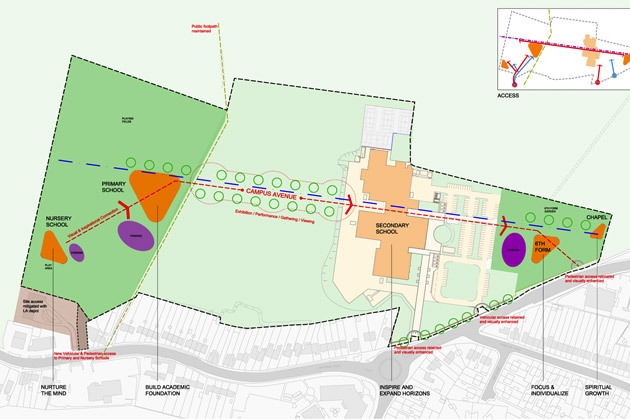 Access to the far west of the site from the current entrance will be difficult and needs a substantial length of road for cars over valuable playing fields. Consequently, we propose to use the existing landscaping depot to access the West of the site. 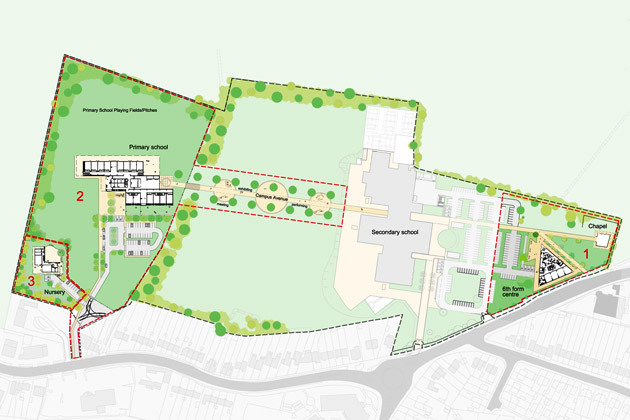 The western area of the site is divided from the main playing fields by a public pathway to the fields beyond which adds to reinforcing this end of the site as a building plot in its own right. 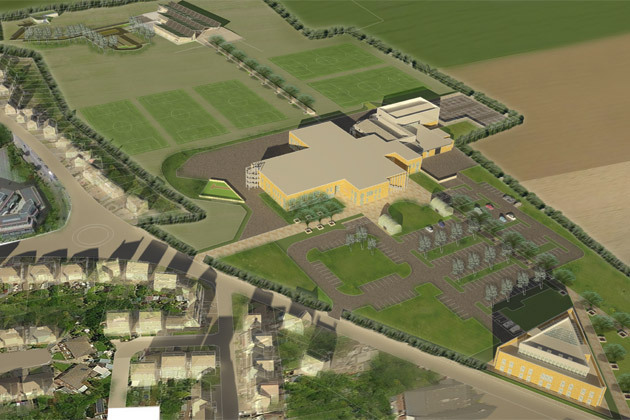 The site is ideal for the location of the primary school and nursery. 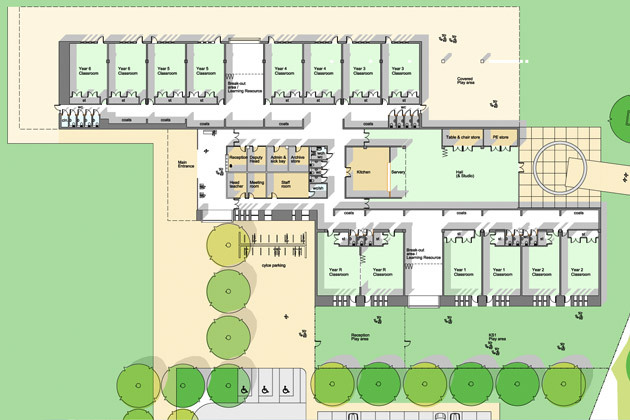 The sixth form building is an expansion of the existing secondary school, and it is sensible to locate it within easy reach of the main building to share as many facilities as possible. 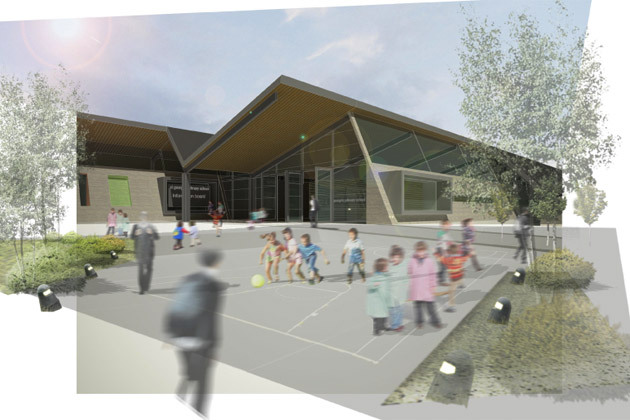 The primary school and nursery are seperate entities in themselves, all be it that the intention is to provide an ‘all through school’, connecting the education pathway accross the site. 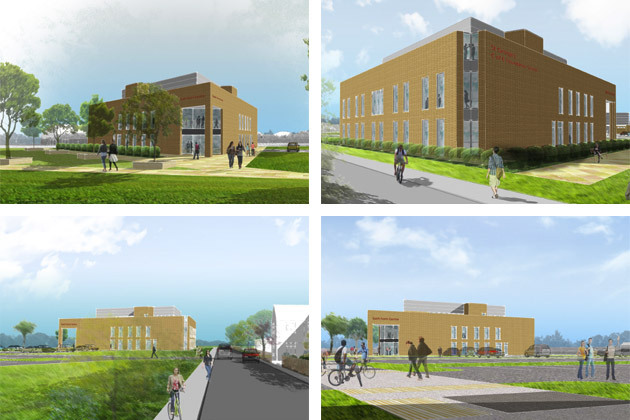 The overall campus will set a framework for staff and students to excel. We have located the new Sixth Form Centre towards the front of the site giving the school a presence on the existing main road. The concept of ‘following the academic trail along Campus Avenue on your way to a world of opportunities’ is completed in the dean’s office on your way to University. The optional design for a Chapel lends itself as a focal point at the extension of the campus avenue, supporting spiritual growth as part of personal development. 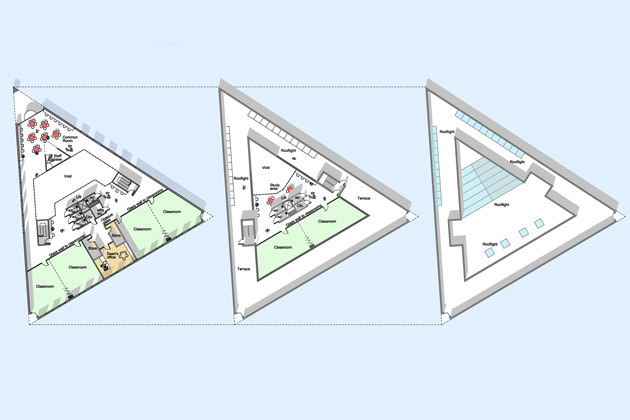 The triangle will identify the new centre with the apex pointing towards the Campus Avenue supporting the architectural language of the new school building, whilst at the same time giving staff and students a sense of ownership for the building to the extent that it becomes known as ‘The Triangle’. The classrooms have been positioned to allow maximum flexibility with the possiblity of combining four classrooms on the ground floor into one with the use of acoustic partitions. 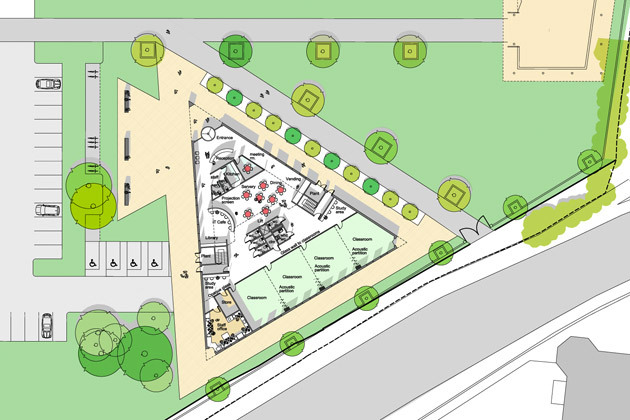 Inpromptu assemblies for the sixth form students could take place in the central hub with students arranged on the ground floor and gallery spaces above. A projector and screen will be included in the central space. Small study areas will be located throughout the building, each with different themes and positions to aid the individual in his or her task at hand. Staff bases will be distributed around the building located strategically to avoid unobserved spaces. We have included a meeting room close to the reception where staff meetings can be held or parent consultations can take place. Where the new 6th form building brings a strong identity to the school amongst the existing structures at the east end of the campus, the primary and nursery schools have been designed to respond to the ‘green field’ context at the far west of the site and to take full advantage of the opportunities the site presents. 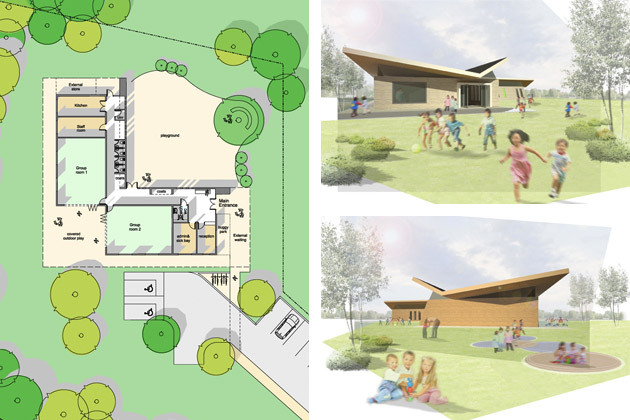 The primary school’s strong silhouette and the V-shaped roofs instill a sense of shelter as they rise and fall creating a variety of scales – from the lofty to the intimate. 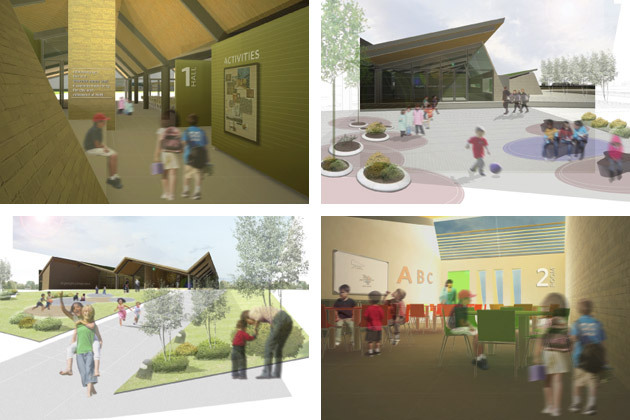 Externally, where they over-sail the building’s edges they serve to shelter the principle entrances, shade the windows and provide ample covered areas for all-weather play. Their specific angles and orientation relate to solar energy generation and form a key element of the project’s ‘renewables’ strategy (see below). The nursery school building reads as a mini version of the larger primary school, dependent but withdrawn from it. 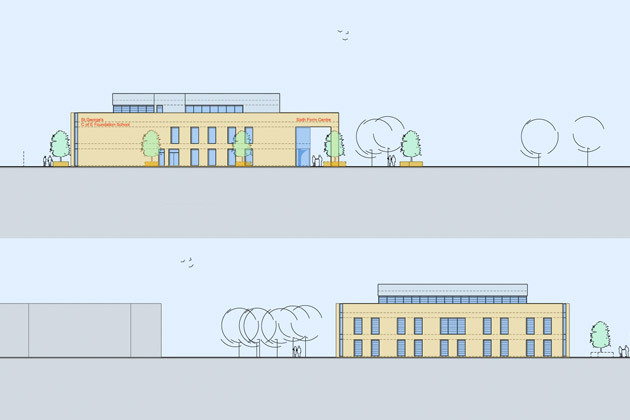 The primary school itself addresses the secondary school along the line of the Campus Avenue – encouraging an exchange between the two education centres including the use of energy, from these new and forward looking buildings. THERMAL WALL – Massive south facing walls form thermal reservoirs absorbing and regulating the extremes of external temperature in summer and protecting against heat loss in winter. SOLAR ROOF – The steeper, shorter roof pitch is angled for optimum solar panel performance (photovoltaic & solar thermal) whilst the building’s true south orientation gives maximum yearly exposure. Over 500 sq m available for use. LIVING ROOF – The shallower, longer section of roof is ideal for planting and adaption as a living roof, protecting against excessive heat gain, regulating internal temperatures and reducing heat loss. ZERO CARBON HEATING – Buried beneath the new playgrounds, water filled pipe networks run to solar powered ground-source heat pumps provide all necessary winter heating for the new buildings.